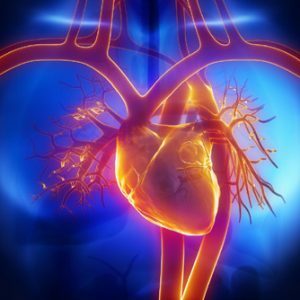 Optimal cardiovascular risk assessment allows doctors to adjust treatment in high-risk patients at an early stage. Cardiovascular diseases includes a number of conditions related to the heart and the vascular network. Examples of these include hypertension, dyslipidemia, stroke, atherosclerosis, thrombosis and coronary artery disease. These are interrelated indications, which tend to be linked in a complex cascade meaning one may lead to another if not treated properly. Risk factors such as dyslipidemia and diabetes, among others, may cause cardiovascular disease. The examples in the submenu on the right show the increased cardiovascular risk of patients with diabetes, renal disease and atherosclerosis. This illustrates the importance of measuring the cardiovascular risk of these patients and being able to change treatment in high-risk patients as soon as possible. The extensively validated AGE Reader provides an immediate and non-invasive cardiovascular risk prediction. The AGE Reader is very easy to use measurement and therefore leads to clinically valuable extra information. The AGE Reader dramatically improves the cardiovascular risk prediction for diabetes, renal failure, and atherosclerosis patients. The method is convenient, easy to use and validated. 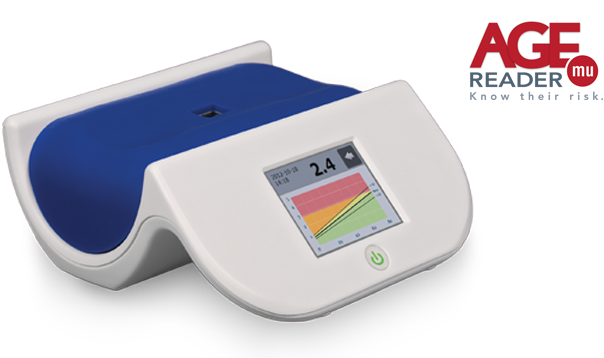 The AGE Reader mu is the next generation AGE Reader that combines a high measurement quality standard with an innovative design, at a reduced price level. The AGE Reader mu is a perfect tool for diabetologists and family doctors.